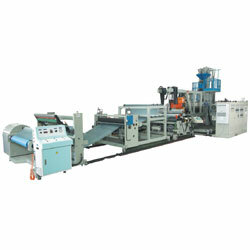 We can manufacture the machines according to customers' requests. 2. Motor 100 HP Siemens motor. 3. Gear box 1 set. 5. Barrel temperature control 5 zones. 6. Screen changer 1 set. 7. T-Die width 1600 mm. 8. Finished product width 1400 mm. 9. Finished product thickness 0.08~2.0mm. 10. Forming unit 1 set. 11. Temperature controller 1 set. 12. Edge-trimming unit 1 set. 13. Taking off roller unit 1 set. 14. Center womder 1 set. 15. Electricity control system 1 set. 16. Total weight 11 tons approximately. 17. Occupied ground area 13660mmx3789mmx2865mm (LxWxH).